Collisions with animals are an unavoidable fact of driving - despite no one wanting it to happen. Fortunately, understanding where and when you are likely to encounter animals on the road and how to react when you do can significantly reduce the chances you will hit an animal. Country areas are full of both wild and farm animals. These animals are drawn to the road because water drains at the roadside create lush grass growth and unexpected watering holes. It's important you always remain alert because of the increased risk in country areas, but you should be especially aware during the high-risk times outlined below. 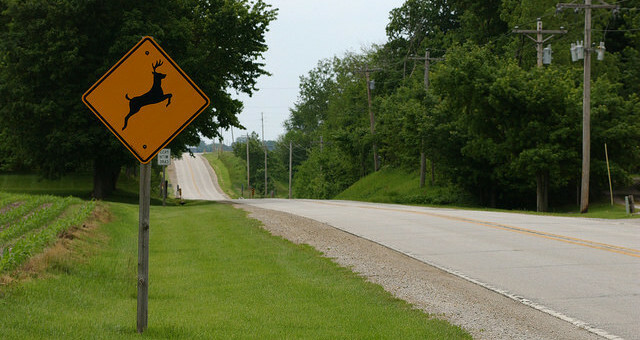 Road signs that warn animals may cross in specific areas should be taken seriously. Remain alert and adjust your driving to the new conditions (e.g. slow down to decrease stopping distance and allow for more reaction time). Always avoid speeding on quiet, country roads (which you should do anyway as a responsible driver). Even when speed limits seem slow based on conditions, the limit may exist to reduce or prevent animal collisions - so keep this in mind. Wild animal activity near roads is likely most active at dawn and dusk. At dusk, the temperature starts to fall and nocturnal animals begin to search for food and water. Similarly, dawn is a high-risk time as the active nocturnal animals return to their shelters to sleep. On top of the increased activity, the lack of light during these times makes animals difficult to see and reduces drivers' ability to detect and react to their presence. Suburban areas near homes are hot spots for collisions with pets. Domestic animals don't need to search for food and water so their movements are more random. Generally an encounter with a pet on the road comes from them escaping their yard or house without their owner's knowledge. This unpredictability means that despite low traffic levels and low speed limits, it’s important to constantly and effectively scan in suburban areas. If you encounter an animal on the roadside, slow sown so you don't startle it. The animal is probably just searching for food and water (which is easy to find near the road) and isn’t consider traffic in this pursuit. Animals encountered on roads are especially unpredictable as an oncoming vehicle is likely to startle, scare and panic it. This will make it difficult for the animals to effectively react, so it's up to you. If you notice the animal with plenty of time and space - slow down to the point you can easily stop if necessary. Then, carefully steer around the animal, trying not to startle it. Animals can also appear suddenly from the side of the road. In this situation, you have little time to react. As such, you should maintain your course and slow down in a controlled fashion. Do not swerve - even if you will hit the animal. Swerving at speed can cause your vehicle to roll, you to lose control or move into oncoming traffic - potentially endangering yourself, your passengers and other roads users. Although it will be a split second decision, keep in mind that your life and the lives of other road users are more important than an animal’s. Avoiding the death of an animal is important, but your actions should not endanger a person. Although circumstances vary, the safest reaction to an animal suddenly appearing in front of you is to remain on course, slow down as much as possible and collide with the animal.